The French weekly ‘Le Canard Enchaîné’ carries no photographs or advertising, its articles are unsigned and the newspaper shuns the web – yet somehow it manages to outsell rivals such as ‘Le Monde’. Just how does it do it? If conventional assumptions about how modern newspapers prosper were a set of iron laws, Le Canard Enchaîné would have folded long ago. A thin, eight-page broadsheet printed on low-grade paper in just two colours, the French weekly publishes no photographs, no advertising and no graphics. Its design has barely changed in 90 years, it runs scoops on inside pages rather than on the front, its articles are unsigned and its editor doesn’t use a computer. Needless to say, the paper doesn’t have a website. Le Canard occupies two floors in an anonymous building off the rue Saint-Honoré in central Paris. The first is a bright, modern set of offices with a reception area dominated by huge reproductions of the paper’s trademark cartoons on the white walls; the second a darker, older open-plan editorial space that feels more like a library reading room than a newsroom. The editor is not alone in shunning computers, it appears. “It has to be one of the last papers in France where journalists write their articles by hand,” says staff writer Sorj Chalandon, delighting – as does everyone at Le Canard – in the eccentricity of the place. Chalandon is one of about 100 employees, of whom 40 are journalists – and thanks to a structure that requires all shares in the company to be distributed among staff, they are also its owners. If that’s the first plank of Le Canard’s proud independence, the second is its refusal to accept advertising, which means it relies solely on sales for its survival. But with about 600,000 copies bought each week – considerably more than dailies such as Le Monde and Le Figaro – the paper turns a healthy profit and has a cushion of €100 million in the bank. “Our preoccupation is not necessarily to make lots of money, but there’s an absolute rule: we must be a soundly-run newspaper, because that’s the price of liberty,” says Horeau. 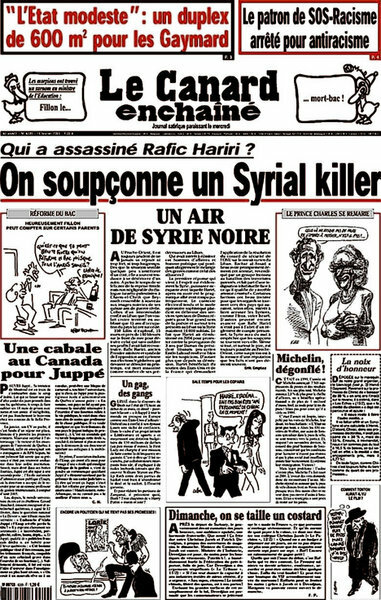 Le Canard Enchaîné is the most reliable and influential source of investigative journalism in France. It has broken some of the biggest stories of recent decades, and its enduring capacity to worry the country’s most powerful people can be seen every Tuesday evening, when a queue of policemen and couriers line up outside its office to collect freshly-printed bundles of the next morning’s edition for government ministries to pore over. The paper’s latest victim was Michèle Alliot-Marie, who resigned as foreign minister in February after Le Canard ran a series of stories about her ties to a Tunisian businessman allegedly close to deposed president Zine al-Abidine Ben Ali. Last summer, two ministers stepped down after Le Canard published details of their spending thousands of euro in public money on cigars and private jets while the government was preparing the public for deep spending cuts. On the page, such stories are surrounded by cartoons, sharp jokes and satirical columns – a combination that has become the paper’s hallmark. “There’s a satirical distance in Le Canard , but every word is researched and investigated. The humour is a way of saying things that can sometimes be very, very tough,” says Chalandon. Le Canard Enchaîné literally meansThe Shackled Duck , but aptly for a paper whose use of wordplay, argot and nicknames makes it largely untranslatable, the name has several meanings. A canard is a duck, but it’s also slang for a newspaper (“a rag”), a lump of sugar dipped in liquor, a false note and an unfounded story. The paper was founded in 1915 by the young journalist Maurice Maréchal as a counterpoint to the bourrage de crâne , or the brainwashing of official propaganda, during the first World War. Press coverage of the war was heavily censored and monitored by the authorities, shielding the French public from the horrific reality of trench warfare with a diet of lies and omission. The first editorial (titled “Quack, quack”) contained all the ingredients that are familiar today: dripping with irony, it declared that everything in the French newspapers was correct. The French public was fed up with “rigorously exact” news, so Le Canard would only publish what was rigorously false. “The people want lies, so we’re going to give them lies.” For decades the paper was known primarily for its satire and sharp comic writing, but that began to change with its work on the Algerian war, when Le Canard published some of the first accounts of French military abuses. While editorial independence and commercial success protect the publication from direct pressure from government, banks and other institutions, successive governments have done their best to stymie its work. A hole in the newsroom wall marks the spot where the secret service planted microphones in 1973 (staff discovered the bugs shortly after they were installed, then identified those responsible), while current staff assume that their mobile phones are being monitored, Horeau says. Le Canard’s sources are a large and disparate group. Some are journalists from other titles who cannot use the material themselves, others government ministers or civil servants. “Our criterion is not ‘who will this benefit or not’,” says Horeau. Despite intense competition and a difficult climate for investigative reporting, Le Canard looks largely insulated from the industry’s tumult. Its institutional conservatism has largely paid off, but what of the decision not even to bother with a website? “We watch what is happening, and we have seen that some people are being ruined by their websites,” Horeau replies. “They lost twice,” he says of French newspaper ventures onto the internet. “Firstly because they spent money to create the site, and secondly because the websites were tools for losing readers. So clearly it’s madness. In recent years, conditions have become more difficult for France’s investigative media. The authorities have become more assiduous in trying to monitor journalists and trace their sources, and Horeau – a staff member at Le Canard for 30 years – says the Sarkozy regime is the most aggressive he has experienced. The paper’s sympathies are clearly on the left, and Horeau says the anti-clerical and Republican convictions of its founder still shape its views. When the left claimed the presidency for the first time in 1981, Le Canard was somewhat wrong-footed, although the editors insist their ideological affinity with François Mitterrand’s Socialist Party did not make the paper hold back when it unearthed embarrassing stories. The paper takes pride, for example, in a furore that followed its revelation that the Mitterrand government, having been elected on a promise to create more jobs, was fiddling the unemployment figures.